When 2-year-old Sophia was told she could pick out a prize for finishing her potty training, she knew just what she wanted. She and her mother, Brandi Benner, visited a Target near their South Carolina home, where Sophia spent 20 minutes looking at all the dolls in the toy aisle. "She kept going back to the doctor doll, because in her mind, she is already a doctor," Benner said. "She loves giving checkups, and if you come in the house, she'll tell you that's the first thing you need." Sophia, who will be 3 in July, was so excited by her choice that she wouldn't let go of her new doll until they reached the register to check out. Did we mention that the doll is black and Sophia is white? The issue came up right away, when a store cashier asked Sophia: Wouldn't she rather have a doll that looked like her? According to her mother, Sophia had a ready answer. "She does (look like me)!" the toddler responded. "She's a doctor; I'm a doctor. She is a pretty girl; I am a pretty girl. See her pretty hair? See her stethoscope?" 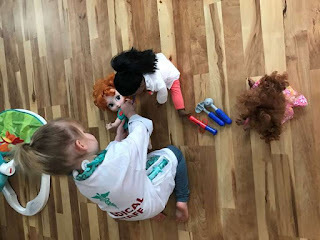 Benner credits the TV cartoon "Doc McStuffins" with teaching Sophia the word "stethoscope." But she credits Sophia for knowing what is important: The doll's skin tone didn't matter. To Sophia, she and the doll share the same aspirations. Benner was relieved she didn't have to defend her daughter's choice and glad that Sophia wasn't fazed by the cashier's question. "If she was another child, that could have discouraged her," Benner said. Benner posted an account of their experience Friday to her personal Facebook page. It's been shared more than 140,000 times and attracted more than 19,000 comments. Most of them have been supportive messages from other mothers or people with similar experiences. The few negative ones don't bother her. "I just want to teach my kids love, and that's included in my own actions," Benner said, explaining why she doesn't engage with negative commenters. Research suggests that kids aren't born with biases about race and gender. But Sophia doesn't know about all that. She just knows that everywhere she goes, she wants her doctor doll to come along.